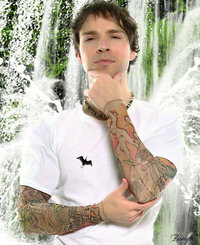 The Writing Well today visits with Edmonton-based sci-fi fantasy author Isaac Hooke. 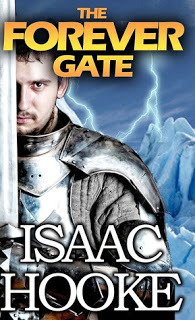 Isaac’s Amazon #1 bestselling science fiction and fantasy saga, The Forever Gate, has captured rave reviews since it first debuted in January. Relying on his imagination and ready access to Wikipedia, this talented writer has issued a new installment every month, with book five set for release later this month. Set in a far future that at first seems to resemble the Middle Ages, The Forever Gate focuses on a man tormented by his past, and how he comes to terms with that past. Isaac tells me that his main goal in writing The Forever Gate is “to entertain.” However, this engineering physics grad also wants people “to take a step back, and ponder what it is to be human, and question what reality really is. Ponder the big questions, really.” As a fan of his work and of the sci-fi genre, I can tell you he’s delivered on both counts. Read below to find out why Isaac loves writing science fiction, his take on world building and what’s next for his multi-layered story. Q. What made you want to be an author, and specifically writing science fiction/fantasy? After I graduated from University seventeen years ago, I worked in the gaming industry for a short stint, then moved on to the higher paying field of Information Technology, where I programmed the middleware that the big corporations used to keep their internal cogs running. Stuck in those soulless companies, I desperately needed a creative outlet, and I found one in writing. Science fiction allows writers, and readers, to explore the very boundaries of perception and reality, of what’s possible and what’s impossible. We can expound and dissect philosophical ideas such as existentialism, desire, identity, and social structure. Q. What inspired the concept of this story? ** SPOILER ALERT ** I’ve been toying with the idea of a fantasy world situated inside a computer simulation for quite some time now. I wanted that simulated world to elements we don’t have in our own world, such as magic. So basically, the story is set inside a hyper-realistic Massively Multiplayer Online Roleplaying Game. Q. In the genre of fantasy, a big challenge is world building. Can you share an excerpt from The Forever Gate that really showcases this element? And so the company rattled off their ages. No one present was over forty-five, though they all looked eighty or more. All save Ari. Hoodwink studied the man uncertainly. Hoodwink rubbed his hands together. “I never asked for the truth.” He stopped the gesture. It was too much like washing his hands. Of the truth. Q. What authors do you admire or draw inspiration from as a writer? J.R.R Tolkien (of course), Robert Jordan, Stephen King, and Lloyd Alexander. My mother is a writer too, and I admire her work. Q. As an indie author, what has been your strategy for audience building? How has The Forever Gate done? I haven’t really seen much affect from social media, other than to give a small bump to my books when I release them. I’ve just been using KDP Select to build my audience, setting my book to free for five days and letting Amazon do the rest. The books have sold pretty well, I’ve been doing a thousand copies a month for all three. Not enough to quit my day job, but decent. Q. Do you have any advice for others looking to follow a similar path and publish their stories? #1 – Have a good pen name, a good title, good cover, good look inside, good description, get at least five reviews, set your book free, advertise the days you’ve set it free on the free sites. Ideally have other books available when you set your book free, so that their visibility increases. Though you’ll still get a nice sales bump on the free book if you get enough downloads (say within the top 50-100 free books on Amazon). #2 – Publish more books. When people finish your first book, they immediately go looking for whatever other works you’ve published. Also, when you publish a new book, Amazon sends out an email 10 days later notifying everyone else who’s every bought a book of yours. I always notice a sales spike in Forever Gate Part One ten days after I release a new book in the series, and that’s the marketing email courtesy of Amazon. Q. What do you do when you are not writing? Photography is a big passion of mine, as is cycling and working out. Of course I love reading, and I’m a big movie buff. Isaac Hooke is the author of THE FOREVER GATE, the Amazon #1 bestselling science fiction and fantasy saga. When Isaac isn’t writing, publishing, and blogging, he’s busy cycling and taking pictures in Edmonton, Alberta, Canada. He has a degree in Engineering Physics. You can follow Isaac on Twitter @IsaacHooke and his website IsaacHooke.com. You can find his book on Amazon here, or, check out his book trailer. This entry was posted in Author Interviews and tagged Isaac Hooke, Sci-Fi Author, The Forever Gate on April 8, 2013 by AnneWainscott.